CLICK TO ENQUIRE NOW – FAST RESPONSE WHAT IS INCLUDED? We offer a choice of two hotel categories: STANDARD and SUPERIOR priced accordingly. All the hotels that we use in Newcastle are within easy reach of the City Centre. A five minute cab ride gets you right into the heart of the throbbing nightlife. guide as to what to expect from our Standard package hotels. together with TV and refreshment tray in your room. Our Standard Package has proved incredibly popular, due to the excellent value that the package provides. An ideal way to enjoy a weekend in Newcastle at a very reasonable price. 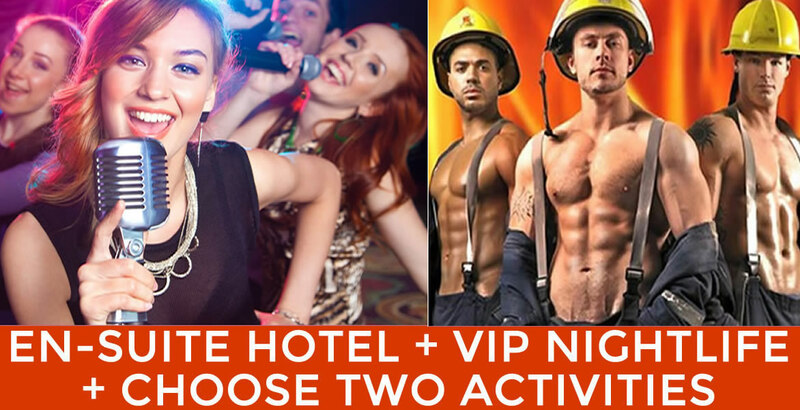 Our nightlife package which is included in the price is the best on the market. Our Superior Package hotels are either in or are within easy reach of the City Centre. Please Note - There is a supplement of £15 per person per night for our Superior hotels. Photographs taken from our Superior Package hotels are shown below to provide customers with a guide as to what to expect from our Superior package hotels. Our Superior Package hotels all have bars, restaurants and the facilities that you would expect from a good quality hotel. Lifts to all floors being a prime example. All en-suite bedrooms are superbly furnished, each one equipped with TV, tea and coffee making facilities, hair dryer, ironing centre, direct dial telephone, computer connection and much, much more. As a general rule, twin or double rooms are allocated. On occasion, if availability is limited or if you prefer it, we may need to allocate triple or quad rooms. Our Superior Package is extremely popular and rooms sell out quickly so early booking is always strongly recommended. Our Superior hotels are of good quality and when added to the night life package shown above, it’s little wonder that our Newcastle Superior package is near the top of our best seller list for all UK resorts. Perfect, if you would a like a better class of hotel, but still want to 'let your hair down'. for EACH AND EVERY NIGHT of your stay. No wondering where to go or whether you'll all get in, no hassles, just superb value. Use the button below to view all the venues and offers, it's incredible! NO QUEUING, NO PAYING ON THE DOOR!